Two faces that sum up the distress felt by many people after a second raid by lead thieves on the roof of St Edmund’s Church in Sedgefield. The Revd. 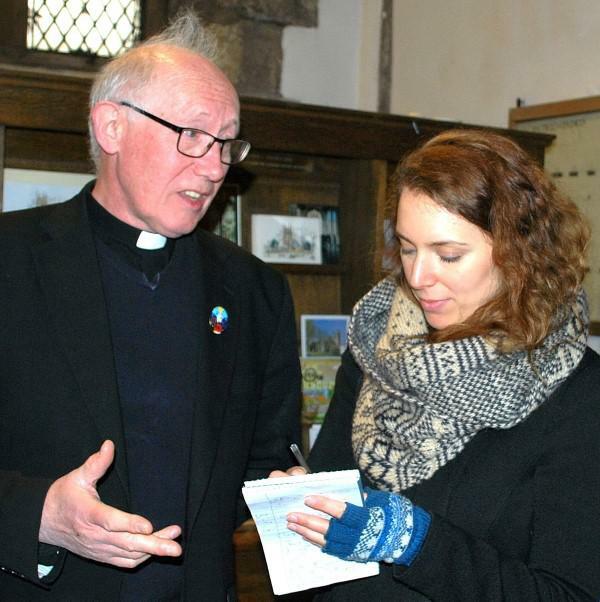 Michael Thompson, Team Vicar in the parish of the Upper Skerne and Parish warden Brian Mutch are pictured during an interview with Northern Echo reporter Flossie Mainwaring-Taylor. The thefts were also featured on both Tyne Tees and BBC Television News. The second raid came within days of the discovery of the first theft and saw thieves strip all the remaining lead on one side of the north transept roof. To prevent the loss of the remaining lead, church officials authorized its removal and the installation of temporary waterproof cladding to prevent further damage to 800-year-old roof timbers, an 18th century box pew and recently-decorated internal walls which are now scarred with brown water stains. Brian plans to post notices on the scaffolding surrounding the site which makes it clear that no lead now remains on the building. 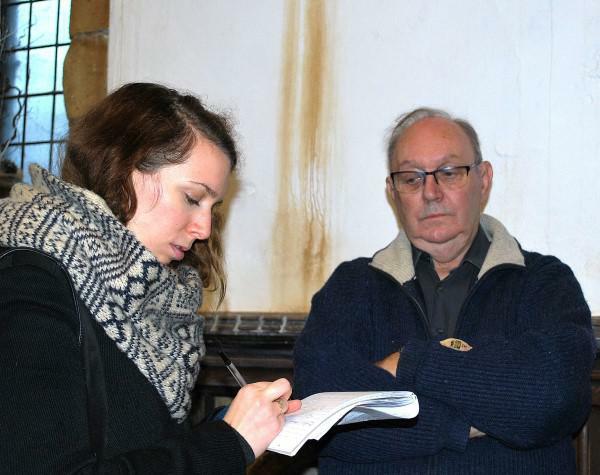 The cost of repairing the roof and replacing the lead with look-alike stainless steel is estimated at £30,000 – which has created a further major headache for church members. A detailed examination of the St Edmund’s insurance policy has revealed that it limits the payout for lead theft to just £10,000. A meeting of the Church Council will be held to analyse the impact of the raids on church finances. The Friends of St Edmund’s have pledged their full support and are already reporting offers of help from local organisations.